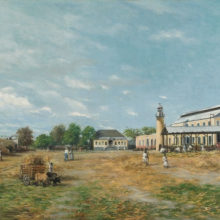 In 1885 Oller was commissioned by José Gallart, an enterprising émigré from Barcelona, to paint “portraits” of his five Puerto Rican sugar-mill complexes, or ingenios. Oller would complete only two. Later that year, Gallart returned to Spain and displayed Hacienda La Fortuna and Hacienda La Serrano (also on view) in the study of his home outside Barcelona as a reminder of the source of his newfound American wealth—Caribbean sugar. Puerto Rico’s sugar production, like that of almost all Caribbean islands, depended on the labor of enslaved people. When the island abolished slavery in 1873, the sugar industry declined dramatically. In his sparsely populated “portraits” of Gallart’s ingenios, Oller seems to refer to the increasing obsolescence of a commerce once fueled by the sweat of human chattel. 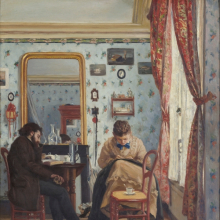 This is one of Oller’s rare interior scenes from his first years in Paris. It evokes the domestic intimacy of a couple sewing and reading. Details such as the objects on the desk and chair, the diminutive pictures on the wall, and the small shelf for glass objects are described with subtle precision. The poses of the man and woman are probably derived from famous works of art by Johannes Vermeer and Gustave Courbet that Oller had seen in Paris. The skull that the young man holds in his right hand is probably a reference to the swift passage of time. This famous painting shows a well-known figure of Puerto Rican history. Rafael Cordero, whose parents had been enslaved, founded the first classroom for male children of color on the island. Some of Puerto Rico’s most distinguished intellectuals emerged from this school. Here, the boys are engaged in many activities, some of which disturb the class and appear to provoke Cordero’s exasperation. Nonetheless, Cordero firmly believed in the importance of education for all sectors of the island’s society, as did Oller, who founded a number of art academies in Puerto Rico. Many of Oller’s students were women, whose careers were often later halted by marriage and subsequent social pressure to give up professional aspirations. This picture may thus be understood as emblematic of the importance of an enlightened populace. Francisco Oller (Puerto Rican, 1833–1917). 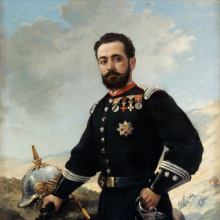 Colonel Francisco Enrique Contreras, 1880. Oil on canvas, 595⁄8 × 411⁄2 × 13⁄8 in. (151.4 × 105.4 × 3.5 cm). Museo de Arte de Ponce, Puerto Rico, The Luis A. Ferré Foundation, Inc.
Oller first met Paul Cézanne in Paris in 1861, soon after the latter’s arrival from his native Aix-en-Provence in April of that year. 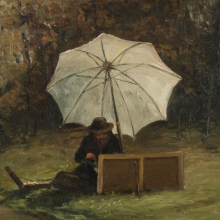 The two painters prepared submissions together to the 1865 Paris Salon exhibition and developed a close friendship. In his depiction of Cézanne, Oller chose a naturalist style that favored pictorial illusionism with clear separations of background, middle ground, and foreground. Here, on the grounds of a Caribbean sugar plantation, two luxuriously dressed mixed-race sisters enjoy a walk with their mother, children, and eight African servants. After the Seven Years’ War (1754–63), the British government sent the Roman painter Agostino Brunias to Dominica, one of its newly acquired Caribbean territories. 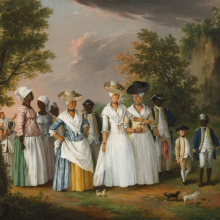 Although Brunias was originally commissioned to promote upper-class plantation life, his paintings soon exposed the artificialities of the region’s racial hierarchies. The Danish Caribbean island of Saint Thomas was home to a substantial population of free people of African descent. 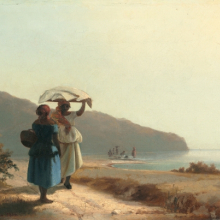 Journeying traders, like the women depicted here, are believed to have distributed the instructions for an 1848 insurrection on the neighboring island of Saint Croix. That revolt led to the immediate abolition of slavery in the Danish West Indies. 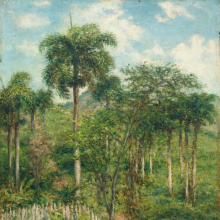 Camille Pissarro, a native of Saint Thomas, would befriend Oller in 1858 in Paris, where Pissarro completed this Caribbean landscape. Beginning in 1884, Winslow Homer—one of the most admired U.S. artists of the nineteenth century—made numerous winter visits to tropical locations. Watercolor became his preferred medium while traveling. 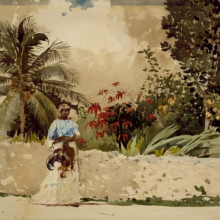 This light-filled composition is one of at least six depictions Homer completed in 1885 of everyday scenes featuring local market women on the coral streets of the Bahamian capital, Nassau. 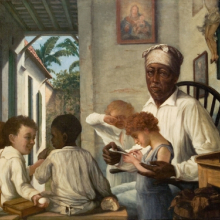 The painter Francisco Oller contributed greatly to the development of modern art in both Europe and the Caribbean and revolutionized the school of painting in his native Puerto Rico. Oller emerged from the small art world of San Juan in the 1840s, spending twenty years in Madrid and Paris, where he was inspired by the art of Gustave Courbet and joined the avant-garde circles of such artists as Paul Cézanne, Camille Pissarro, and Claude Monet. 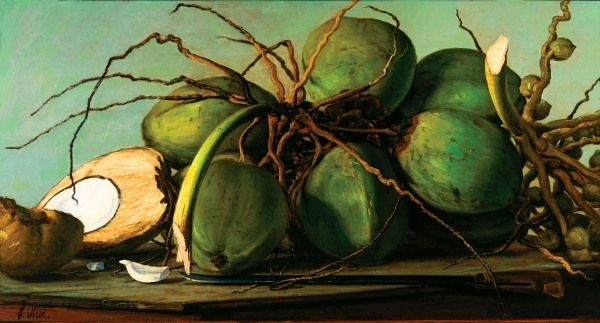 While European Romanticism, Realism, and Impressionism formed a critical jumping-off point for Oller’s aesthetic, his most important source of inspiration was Puerto Rico, where he painted tropical landscapes, still lifes with indigenous fruits and vegetables, and portraits of distinguished artists and intellectuals. This is the first U.S. exhibition to present Oller’s work within both its New and Old World contexts. 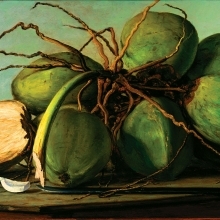 Impressionism and the Caribbean: Francisco Oller and His Transatlantic World is organized by Richard Aste, Curator of European Art, Brooklyn Museum, and Edward J. Sullivan, Helen Gould Sheppard Professor of the History of Art, New York University. Edward J. Sullivan’s book From San Juan to Paris and Back: Francisco Oller and Caribbean Art in the Era of Impressionism (2014) accompanies the exhibition. Generous support for this exhibition is provided by the National Endowment for the Arts, Christie’s, and JPMorgan Chase & Co. Additional support is provided by Carmen Ana Unanue, M. Salomé Galib and Duane McLaughlin, Julius Leiman-Carbia and Kyle T. Smith, Dr. Blas Reyes and Dr. Hilda Capo, the Norman and Arline Feinberg Exhibition Fund, and the Martha A. and Robert S. Rubin Exhibition Fund.